If you're looking for New Mexico online poker, then you'll be happy to know that there are several leading rooms for you to choose from. Real money online poker in New Mexico isn't an activity that the authorities spend any time fighting against. As long as you play privately on your own computer, no legal action will be taken against you. The Land of Enchantment does allow licensed live poker, such as that spread in the Buffalo Thunder Casino in Santa Fe and the Sandia Poker Room in Albuquerque. Playing online might be a better option, though, because the variety of games offered and the broad range of stakes present at the top online sites trump anything to be found in brick-and-mortar card games. Internet poker is also more convenient because you don't have to get dressed, drive to another part of the state, and wait around for a seat to open up. There have never been any instances that we could dig up wherein an individual player was targeted by the laws on the books because that person gambled online. Law enforcement prioritizes going after illegal offline games held within the state, and it reserves the most serious penalties for those actually in charge of running these gambling activities. You won't encounter any legal obstacles when logging onto your favorite site and playing your cards for all they're worth. 8. Address in Nearby State? The online poker operators that serve New Mexicans range from the small to the large, the stingy to the generous, the shady to the prestigious. Rather than choosing one of them at random, it's far more useful to look over our hand-picked selections of the premier internet card sites for NM residents. We've evaluated all entities in the market to narrow the list down to those that are reputable and honest, and they all pay out winnings rapidly and without fuss. Ignition is the same as the old Bovada, just rebranded and under new ownership. All the features that made its predecessor a success, including anonymized games and the largest player volume among U.S.-facing sites, are present here. When you sign up for an account today, you'll get a 100% up to $1,000 poker bonus that clears at a rate equal to 30% of your tournament and sit-n-go fees returned back to you and slightly less in ring game rakeback. As mentioned above, all tables at Ignition and the rest of the PaiWangLuo Network are anonymized, meaning that you won't see anyone else's username, and they won't see yours. This reduces the ability of professionals to track the play of novices and hunt them mercilessly. Because of its recreational-friendly environment, Ignition has some of the softest games to be found across the entire internet. Cash tables start as low as $0.02/$0.05 and run up as high as $10/$20. No Limit Texas Hold'em is the most popular format, followed by Pot Limit Omaha and Pot Limit Omaha/8. There's also Limit Omaha-8 and Limit Hold'em action, but you won't always be able to find a seat unless you're ready to mix and match table sizes and stakes. Zone Poker delivers excitement because when you muck your hand in this fast-fold variant, you're brought right away to a new table and get another set of hole cards. There's thus no waiting around in between rounds, and you can enjoy non-stop action. SNGs cost as little as $1 + $0.05 and as much as $200 + $14, depending on your risk tolerance, and you'll see non-standard Triple-Up contests listed. They pay out the top third of the field an amount equal to three times the buyin. Moving over to multi-table events, there are plenty of tourneys in the lobby every day, priced from microstakes up to those costing hundreds of dollars to enter. On Sundays, you can pay $150 + $12 and join the $100,000 guaranteed tournament. Throughout the year, there are many tourney series, like the Super Millions Poker Open, with significant prize pools and dozens of events. You can access the poker room from a PC or Mac with a downloadable client, and there's also a web app that works with mobile systems. Unfortunately, tournaments and sit-n-goes aren't present in the mobile interface, but cash games are. Upon making your initial deposit at Ignition, you'll not only get a poker bonus of up to $1,000, but you'll also receive another 100% up to $1,000 to play the hundreds of casino games, which are fully available to smartphone and tablet users. Follow the banner above to create your account and start playing today. If you'd like to know more before taking this step, then you can read our thorough review of the Ignition Casino Poker room. The Chico Network sites maintain busy poker rooms, fully featured casinos, and sportsbooks with high betting limits. This is the third-largest place for poker online in the U.S. market. Our recommended member of this network is Sportsbetting.ag. You're entitled to a massive 100% up to $2,500 welcome bonus when you join, worth 33% rakeback whether you elect to play ring games, sit-and-gos, or multi-table tournaments. If you want to play for pennies, then the $0.01/$0.02 NLHE and PLO games are a great place to get started. If you'd rather risk more significant sums on your wagers, then you'll find both types of poker going up to $5/$10. Split-pot Omaha is also available in PL form, but the range of stakes and number of active tables is a bit limited. Sit n' goes are present from $0.05 through $500 + $25, and they fire off pretty regularly up to the $200 + $10 level. The most notable weekly tournament is the Main Event, a $90 + $9 competition that guarantees $50,000. On the last Sunday of each month, this prize pool jumps up to $100,000 while the price increases to $100 + $9. You can run the SB.ag poker client on either a Windows machine or a Mac. Sportsbetting.ag also maintains a mobile app that's quite robust and contains almost all the games as the regular desktop software has. You can install it on your iOS or Android system and then play whenever you have a spare moment. Most of the rest of the gambling options that this company offers can also be accessed through the mobile platform. As you continue playing at the tables, you'll amass comp points, which can be traded in for tournament buyins, worth about 5% of your total rake back. You can enhance the status of your real-money balance even more by achieving one of the top spots in the leaderboards. They exist for cash games, sit-n-gos, and MTTs, and they award $20,000 every week. To join up at Sportsbetting.ag now, click on the banner above. To learn more about the benefits of playing here, peruse our detailed Sportsbetting.ag review. For another, virtually identical site on the same network, check out our comprehensive BetOnline page. As one of the first – if not the first – sportsbooks to open up shop online in 1996, Intertops has a strong history of reliably cashing out winners and conducting its operations fairly. Although the poker room isn't the main product of the firm, it nevertheless values its players and grants them numerous promotional perks. Intertops caters to new depositors by issuing them a 200% up to $1,000 first deposit bonus as well as numerous reload bonus offers. The bonus doesn't release equally for every game, but it can be worth as much as 27% rakeback. When you use the links here at Professional Rakeback to sign up, you'll also get 36% dealt rakeback as a matter of course for the lifetime of your account. Further sweetening the pot are 100 free lines to use in the attached casino, which are worth north of $90 in expected value. The only problem at Intertops is game traffic. Although cash game tables exist with high blind levels, they're almost completely deserted because most customers prefer to play at $0.25/$0.50 or lower. The same issue plagues the SNG tab where you're unlikely to see any running contests above $10. Tournaments are a bit better because there's a $50 + $5 Sundowner tournament every day with a guarantee of $1,500 ($2,500 on Sunday). Many smaller daily MTTs round out the schedule. Though the download version of the poker software works only on Windows, there is an Instant Play program available on the Intertops website. It works for Mac, iOS, Android, and pretty much every other operating system out there. It has its flaws, but it's better than nothing. The rewards at Intertops don't stop with bonuses. There's a $4,000 rake race every week, and you can actually score a prize by grinding out as little as $100 in rake. Loyalty points give you free goodies whenever you cross certain thresholds, and it's even possible to spend your reward chips on no-deposit bonuses. Stay on the alert for casino free spins, special freerolls, and other time-sensitive promos. If all of this sounds good to you, then follow the above banner to go to the Intertops website. For more info, read our in-depth page about Intertops' poker offerings. Or browse through our page on Juicy Stakes, which is on the same Horizon Poker Network as Intertops. The Winning Poker Network and its flagship site, Americas Cardroom, is the #2 online location serving the United States as determined by ring game player liquidity. It also has bustling SNG and MTT sections, so no matter what type of game you prefer, you'll find it here. Americas Cardroom provides a 100% up to $1,000 bonus as well as $50 in credits to use on Jackpot Poker sit and gos. Long-term rewards at Americas Cardroom come through the Elite Benefits program. The more you play, the bigger and better the freebies you'll get. Those at the top of the ladder even receive complimentary packages to the Punta Cana Poker Classic in the Dominican Republic. High rollers consider this the best American poker room because NL Hold'em and PL Omaha are present up to $25/$50. Of course, the number of people who wish to play this high doesn't exactly constitute a crowd, and so the smaller games are more popular. The lowest level is $0.01/$0.02, which caters to the low-rolling set. There's a surprising amount of limit traffic here for micro, mid, and high stakes in Hold'em, Omaha/8, Seven Card Stud, and Seven Card Stud Hi-Lo. Sit-n-gos are usually the red-headed stepchildren of online poker, but at Americas Cardroom, they take center stage. On top of an assortment of traditional SNG games with buyins ranging from one figure to four, there are also two unique variants: Jackpot Poker and SNG 2.0. They combine random elements with normal gameplay to deliver an experience that's interesting and potentially very profitable. Multi-table tourneys are also a strength at WPN as evidenced by the fact that this network hosts the largest Sunday Major open to Americans: the $200 + $15 Sunday Special with a $150,000 guarantee. Several times per year, the Online Super Series appears, handing out millions in prizes. Another recurring happening is the Million Dollar Sunday, which pops up every few months and allows you to contend for your share of $1 million! Click on the banner aboveto go to ACR and set up your new account. If you wish, you can first take a look at our Americas Cardroom review to get an additional understanding of how this site works. Americas Cardroom is the most recognizable brand on the Winning Poker Network, but there are others. Like any other poker network, all the skins work together to keep their tables more populated than they otherwise would be. If you're in search of an alternate site on the WPN, then BlackChip Poker (read review), True Poker (read review), or PokerHost (read review) may be just what you seek. Don't neglect to investigate our WPN rakeback offers if you'd rather have regular RB payments instead of the Elite Benefits rewards. A relatively new network, having only opened for business in 2014, the Grand Network is nonetheless a credible entry into the American internet poker scene. This is because its leading entity, 5Dimes, has already established a solid reputation as one of the best bookmakers around. It's unlikely that 5Dimes will be able to adequately serve as your main stop for online poker because the player volumes simply aren't there. We advise you to choose another room as your primary site and reserve this one as your secondary or backup plan. What games you do observe running will be denominated between $0.05/$0.10 and $1/$2, and they will be among the juiciest to be found anywhere. Microstakes MTT players will love 5Dimes, because of its fee-free tournaments. There are a few of them every day for buyins of $5 or less. While you won't be able to buy a new car with your winnings, these contests do permit you to boost your results by 10% instantly. A $500 freeroll with no entry restrictions is held every Sunday. You can log into the 5Dimes poker room via your PC, Mac, iPad, iPhone, Android device, and many other computing systems. Whatever type of machine you use, you'll get 50% rakeback through a series of unusual sit-and-gos that accept points for their buyins. In reality, you'll almost definitely be able to get more than 50% back over the long haul because the winner of each SNG gets 100% rakeback on the points used to enter. Create your 5Dimes account today by clicking on the banner above. Our synopsis of the Grand Poker Network will answer any remaining questions you have. As you can see, there are a few trustworthy internet poker rooms that would be happy to add you to their customer base. It can be a chore to compare all their selling points against one another and determine the right one to call your online home. There aren't any set-in-stone rules for making your decision, but we do have a number of general criteria that you can use to help steer yourself in the right direction. + If you enjoy multi-table tournaments with huge prize pools, then Ignition and the Winning Network have tourneys to satisfy you. + If you relish the nonstop pace of the fast-fold format, then Ignition's Zone Poker allows you to see hundreds of hands per hour. + If you have your eyes set on the largest possible welcome bonus, then the Chico Network and its $2,500 maximum should be enough for you. + If continuous rakeback payments seem like a good idea to you, then check out Grand, Intertops, and WPN. + If you're a SNG fan, then the sheer number of varieties present at the Winning Poker Network are sure to appeal to you. + If you're a Mac or mobile user, then Chico, Ignition, and Grand have compatible software that's smooth and feature-rich. + If a robust promotional lineup is what you feel you deserve as a player, then Intertops is probably your best bet. Most poker rooms that conduct business over the internet support credit cards for deposits and checks for withdrawals. Each firm also has a number of other payment methods that it uses, but these vary from place to place. You'll be fine with credit cards and checks, but you may be subject to certain fees and delays when it's time to receive your payouts. You can avoid these hassles by conducting all your money transfers using the virtual digital currency, Bitcoin. It allows for the rapid movement of cash with low fees. If you'd like to learn more about this cryptocurrency, then consult our guide to using BTC. All of the online organizations that we've pointed you toward support Bitcoin. Whoever commits gambling is guilty of a petty misdemeanor. This wording “dependent upon chance, even though accompanied by some skill” could be interpreted to include poker although it could contrarily be argued that games in which skill predominates aren't covered by this language. There is an enumeration of exceptions that don't count as a bet, such as legitimate business transactions, contests of skill, speed, strength, or endurance, lotteries, and “betting otherwise permitted by law.” If poker falls into the grouping of "contests of skill," then it's not counted as gambling, and there are pretty convincing arguments that it should be so treated. We poker players aren't alone in thinking that skill is the dominant factor in the outcomes of poker games: In 2012, in U.S. vs. DiCristina, Judge Weinstein explained why poker is a game of skill, not chance. This last category of "betting otherwise permitted by law" is why NM hosts countless gambling enterprises notwithstanding its unambiguous statutes prohibiting most forms of wagering. The organizations that legally offer gambling services are under the supervision of the New Mexico Gaming Control Board as stipulated by the relevant sections of the law with only very limited exceptions. This is a bit misleading. 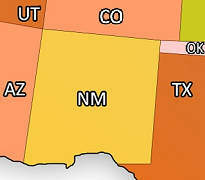 It's not the case that internet gambling is prohibited by the federal government and is therefore illegal in New Mexico. It would be more accurate to say that if the state doesn't allow the activity, then this would thereby bring the enforcement mechanisms of the federal UIGEA into effect. Now, when it comes to actually punishing illicit forms of real-money gaming, the authorities are going after the ones actually operating the games, not regular players. Though it is theoretically possible for you to get in minor legal trouble for playing online poker, dpending on how the powers-that-be interpret the statutes we've discussed above, we have been unable to turn up any records of any arrests ever having been made for this reason in Santa Fe, Albuquerque, or any other city or town in the state. Most of the raids involving illegal gambling charges deal with people who are managing unlicensed physical facilities for playing cards or engaging in other types of betting transactions. They are usually charged with additional crimes, including felonies, beyond the simple petty misdemeanor that the state calls gambling. The question of whether or not online card games are illegal in New Mexico is thus an academic one. You won't be penalized at all for joining a virtual poker game. New Mexico had been occupied by Spain since before 1598, and when Mexico achieved independence in 1821, it inherited the area from its former colonial masters. 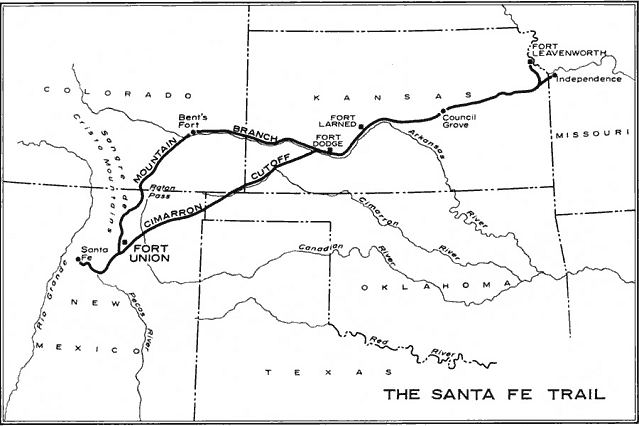 The Santa Fe Trail became an important commercial thoroughfare for both the United States and Mexico in the nineteenth century, and weary travelers would often stop at saloons for rest and recreation. Gambling was certainly a favorite pastime, and the most noteworthy parlor for wagering in Santa Fe was undoubtedly the Barcelo Palace, owned by the remarkable Doña Maria Gertrudis “Tules” Barceló. She excelled at card games and was often able to relieve her customers of all of their gold. Throughout the 1830s and '40s, tales spread of the lavish decorations of the establishment and the beauty of the proprietress. Tules Barceló continued to remain prosperous even after the region she lived in was transferred to the United States following the Mexican-American War in 1848. Undoubtedly, her decision to offer a loan to the occupying U.S. Army was one factor in her ability to weather the transition. The appearance of the railroad in the next few decades brought in many settlers who didn't like the lawlessness and sin they encountered when they arrived at their destination. Legislation started to appear to prohibit games of chance, and by the early twentieth century, gambling was illegal throughout the territory. This remained true when NM was admitted to the Union in 1912 as the 47th state. After the Second World War, pari-mutuel racetrack betting was authorized. This was a boon to the economy as people flocked in from neighboring states that lacked racetracks, like Texas. Charitable gambling and bingo followed in 1978. During the early '90s, pressure from Native tribes led to compacts to establish real-money casino gaming during the governorship of Gary Johnson in 1995. In the same year, the New Mexico Lottery was established. With horse racing revenue slipping, racetracks were allowed to become racinos with the addition of slot machines. Today, there are more than two dozen Native American casinos as well as five racinos within the state: a surprising total given that the population is only just over 2 million. The racinos don't offer poker, so you'll have to head to one of the tribal locations to play it. The Sandia Poker Room in Albuquerque is the largest place for cards with 15 tables spreading daily Limit Hold'em, No Limit Hold'em and Limit Omaha/8 games. In October 2018, the Pueblo of Santa Ana tribe opened up a sportsbook at their Santa Ana Star Casino near Albuquerque. The tribe contends that it's fully legal for them to do so under the terms of their gaming compact and federal law now that the prohibitions contained in PASPA have been removed by the Supreme Court. This reasoning hasn't yet been tested in court, but New Mexico's elected leaders don't seem to have raised any objections to it. We could see more brick-and-mortar sportsbooks pop up in New Mexico in the near future. While the authorities in the Cactus State have shown a willingness to tolerate many forms of regulated cash betting, we can't really say that they've ever expressed any enthusiasm for online real-money gaming. 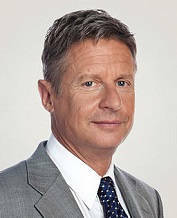 Former governor Gary Johnson was an exception, and he spoke out in favor of the game while running for President of the United States as a Libertarian in 2012 and 2016. However, Johnson is no longer involved in politics, either at the federal or state level, and so his views have no more impact on potential NM online poker legalization than do those of any other private citizen. Furthermore, there are powerful interests opposed to any scheme to authorize online gaming. The Navajo Nation has negotiated to have a clause inserted into its compact whereby it wouldn't have to share any casino revenue with the state if any online gambling licensing framework were deployed. When we consider the small size of the state and the lobbying forces arrayed against online poker, it's pretty unlikely that there will be any arrangements made to legitimize internet gambling within the state. For the officials and police in New Mexico, online poker is the last thing they're thinking about cracking down on. Online poker in New Mexico is a pleasant pastime that won't get you into trouble unless you're attempting to set up an illegal betting ring yourself. Choose a site from among our partner organizations, and then get ready to play some cards without even leaving the house. If you are lucky enough to have another address in a nearby state, be it your business address, summer home, second apartment, family home, etc, you may have other online poker options available to you. Here are a list of the states that border New Mexico and Professional Rakeback's review on each of them: Arizona, Colorado, Oklahoma, Texas, Utah. If you have a secondary residence in another part of the country, then our page on U.S. online poker may interest you. It contains an overview of all the reputable sites that Americans can play at as well as links to our reviews of site options for all 50 states. If you've found this page informative, then you might want to share it with the people you know. There's a lot of ignorance on the subject of online poker in New Mexico, but you can help spread the word about the reliable options for this game that are available. New Mexico online poker is a topic that generates a lot of discussion and confusion. You can look below for the answers to some of the most frequent questions about online poker within the state. Is it legal for Global Poker to do business in New Mexico? The firm claims that its sweepstakes poker model makes it legal in all 50 states, including New Mexico. Nevertheless, we aren't completely convinced. Space constraints prevent us from thoroughly discussing this matter here. You can read our Global Poker review for more insight into this topic.